New Pickleball Courts & Basketball Courts at Library Field this Fall! 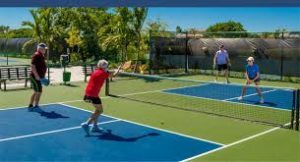 News // Recreation // New Pickleball Courts & Basketball Courts at Library Field this Fall! This Fall the Woburn Recreation Department will be opening 4 permanent Pickleball Courts, at Library Field!! What is Pickleball?? A Paddle sport created for all ages and skill levels. The rules are simple and the game is easy for beginners to learn, but can develop into a quick, fast-paced game for experienced players. The Basics- A fun sport that combines many elements of tennis, badminton, and ping pong. Played both indoors and outdoors on a court 1/3 the size of a tennis court. Played with a paddle and a plastic (wiffle) ball. Played as double or as singles. The Recreation Department will announce shortly, the times that the courts will be available for play, sign-up sheets, how to obtain equipment for play and training for beginners. In addition to the 4 Pickleball Courts we are also installing 2 new Basketball Courts with brand new nets at Library Field! Please check www.woburnrec.com for an update as to when the Courts will be open for use!